Oh, Fox. Poor, sweet Fox. I know Idol has started to gain speed as it tumbles downhill, tangled in Steven Tyler's feather hair extensions, but we thought the fact that New Girl is fantastic would be enough for you. But no. You had to push it one too far. You're starting to seem a bit desperate. You know what I'm talking about, don't you? Let's just talk about it and get it all out. Oh yes. They went there. Don't worry, it's nothing like The Voice except it's exactly the same in almost every way. Four celebrity judges. Spinning chairs. Lots of choosing and rejecting going on. But with romance. Is this or is this not the worst idea of all time? 1. It's an in-studio dating show, and the year is 2012. What focus groups did they use to determine the demand for this thing? People perpetually suspended in MTV in 1996? 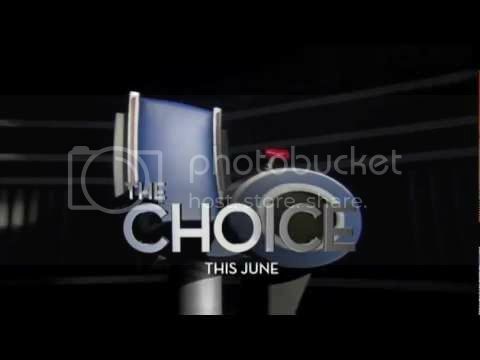 Of course, The Choice has more in common with The Voice than just chairs — like that title, for instance? “The Choice seems like an obvious title because you have to make a choice,” Darnell says, then playfully adds: “I’m just now realizing it rhymes!" Really, Liar McPantsonfire? Really? You are JUST now realizing it rhymes with "The Voice?" If you're going to create a D-List knock off of a popular show on another network, at least go big or go home. Own up to it. Don't act like Vanilla Ice explaining the difference between "Ice Ice Baby" and "Under Pressure." No one thinks you're clever here. Especially since your justification for the name was essentially: "uh, you have to make a choice…so we called it the choice." UGH. I want to punch you in the face. 3. The button on the spinning chairs has been replaced with a lever and dubbed a "love handle." A LOVE HANDLE. The creative team deserves to be fired immediately. This is the laziest nonsense I've ever seen. Can we just go ahead and veto this show before it even happens? Fox: embrace the concept of "quit while you're ahead" and just fill the time with New Girl reruns instead. Like anyone would even be mad.